Today I just had to join in on this week’s Top Ten Tuesday, hosted at The Broke and the Bookish. Because, Aaaargh, buying books I desperately want to read — and then not reading them — is my undoing. I wasn’t bad until I started working in a library. Once I worked at a library, I got much much better at not blowing my budget on books. I only bought books I really really wanted to read. Then I didn’t read them, because they didn’t have a due date! Sometime around 2010, I finally had a clue and made myself a new Reading Rule: I would alternate reading library books with books I owned. By then, I’d started getting Advance Review Copies, and it seemed unethical to have taken so many at ALA conferences but not read them. Not to mention the books I’d bought. So I started alternating between books with a due date and books without a due date. That was good, and worked well for me. But it wasn’t complicated enough for this Lover of Rules. So last year, I made myself a much more complicated system. As far as books I’ve bought, it boils down to I read one of those every sixth book. But at least I get to them! Eventually. Don’t you hate it when you actually preorder book…and then don’t get around to reading it until a few months after it comes out. But this one is next up when I am ready to read a book I’ve bought. 2. The Fox, by Sherwood Smith. And The King’s Shield. And Treason’s Shore. And Banner of the Damned. Sherwood Smith is unquestionably one of my favorite authors. She’s had Sonderbooks Stand-outs 12 times. But here’s what happened: I read Inda and made it a 2007 Sonderbooks Stand-out. But that was the year I was finishing my MLIS, looking for a job, and trying to get my life together. I never got a review written. When the sequel came out, I eagerly ordered it. But then I thought I really should reread Inda first and write a review. Now there are four hardcover books waiting for me. They are large books. I know that if I tackle them, it will be a long time before I get around to library books again. Aaargh! I’m actually hoping, sometime soon, to make Inda the next book I reread in my six-book cycle. Then to get to the others…. I loved Beastly and A Kiss in Time. Just haven’t gotten to these ones yet. 4. Alchemy of Fire, by Gillian Bradshaw. And The Elixir of Youth, The Somers Treatment, The Sun’s Bride, Bloodwood, Dark North, and The Land of Gold. I bought these long before I made any rules about alternating with library books. And after there got to be a certain number, some kind of critical mass built up. I love Gillian Bradshaw! One of her books was in my very first issue of Sonderbooks! Must get these read! 5. Adventures of the Scarlet Pimpernel, by Baroness Orczy. Also League of the Scarlet Pimpernel, I Will Repay, Sir Percy Hits Back, Pimpernel and Rosemary, and The First Sir Percy. I bought these with much delight when Amazon was relatively new. You could find books that had not been in print! Books in public domain now reprinted! I didn’t have to find the Scarlet Pimpernel novels in used bookstores any more! I read some, I admit, and I still mean to read them all. But somewhere around the fifth or sixth book, I lost steam. Another author I adore. Bought them, but they didn’t have a due date…. This one’s particularly annoying. Because I had this checked out from the library. It’s a big fat book, and it was incredibly good, incredibly insightful. So I decided to buy my own copy, so I could read it at my leisure and really get a lot out of it. Well, then it didn’t have a due date…. This looked so fascinating. Haven’t cracked it open. 10. The Pinhoe Egg, by Diana Wynne Jones. Also House of Many Ways and The Game. There you have it! The perpetual problem: So many books, so little time. Sigh. Bummer! Making this list did not make me feel better about these neglected books! Because I still really really want to read them! Sigh. Top 100 Chapter Books Poll – Again! As I said last night, Betsy Bird, who writes School Library Journal’s Fuse #8 blog, is doing another Top 100 Chapter Books Poll. You have two more days to get in your votes! Anyone who loves books, do this soon! You’ll be so glad you did! I had a terrible time limiting my list of Chapter Books to only ten. In fact, the only way I could do it at all was to take out some of my absolute favorites because part of what I love about them is the romance. Come to think of it, ALL of these choices, I read at one time or another to one or both of my boys (or my husband did). So I can safely say that all of these books are definitely children’s books. Though I can also firmly say that there are adults who will love them, too. And I’m afraid I only read half of them as a child myself. I definitely still keep wavering with the final choices. In fact, let’s see if I make any last-minute changes as I post this list! I mentioned last night that I would have loved to include Emily of New Moon. But this is right. Anne is classic. Anne is the heroine who started it all. I first read this book in 10th grade, and I found it a breath of fresh air after all the adult books I’d been reading. Then, as I was in high school and college, they slowly came out with more and more of L. M. Montgomery’s books. I also own all the volumes of her journals and everything I could get my hands on of hers. My absolute favorite is The Blue Castle, but it’s actually a book for adults. Anyway, Anne Shirley is a character who comes alive. I know this one won’t make the list, but I can’t let it go unrecognized. This was the first book I ordered from Book-of-the-Month Club, and it was so good, I blame it for all the other books I ended up ordering. When I moved to Germany, my first purchase was a copy of this book in the original language (German). Momo is a little girl with a gift for listening. So when gray men come and steal people’s time by convincing them to save it, Momo is the only one who can see them, because she really listens to them. This book is mythic in scope. I tell the whole story of how much I love this book in my review. Let’s just say that I remember my mother reading it to me. Then I remember reading it to my little brothers and sisters. Then, in college, I learned that one of the most fun things to do was read with a group of friends, where different people read the different voices. And finally, I got to read it to my sons, or together with my sons. Oh, and I’ve read it in German! One of the funny things is that it reads on different levels. I remember as a child just taking the things said as perfectly reasonable and matter-of-fact that now I think are hilarious. This book is a work of genius. Now, to be honest, The House at Pooh Corner is a little better, since it includes Tigger. However, last time I voted for The World of Pooh in order to include both and my vote was totally wasted. I’m sure everyone who reads the list will be thinking of ALL the Pooh stories. As I said in my review, no kid who reads this book will ever look at a closet door the same way again. I remember reading this book on the way to school and having to stop right when Bilbo was in the tunnel leading to the dragon’s lair. That was excruciating! When we were reading to both our kids together, my older son said we had to read this book next. I was skeptical, but by the time I finished, I was a complete fan. And it grows on me with each rereading — because I notice more clever things each time. The second book, The Queen of Attolia would be near the top of my YA list. Oh, our family got hours and hours and hours of enjoyment out of these books. We read all of the first five out loud as a family, with no reading ahead. (Or as little reading ahead as we could stand.) We read books #3 and #4 on family vacations, and ended up putting off a visit to Neuschwanstein Castle because we just had to finish Harry Potter and the Goblet of Fire. This book isn’t perfect, but how it endures. I didn’t read this until I was in college. When I did, I was so grateful to the person who told me about it. This book has such childlike exuberance. Pippi is someone we’d talk about as if we knew her. (“And she sleeps with her feet on the pillow!”) This is a child-sized tall tale. My favorite of his is Seven Day Magic, but Half Magic is more well-known, the first one I read, and a classic concept. Oh, so do I really have to leave out so many? I wanted to include Little Britches, by Ralph Moody, Dealing with Dragons, by Patricia C. Wrede, The Wonderful Wizard of Oz, by L. Frank Baum, and Black Beauty, by Anna Sewall. I hope other people include them! And the ones I decided were YA, but that I love, love, love are The Blue Sword, by Robin McKinley, The Goose Girl, by Shannon Hale, and The Witch of Blackbird Pond, by Elizabeth George Speare. I am helping Betsy compile the results, but I am sure if I changed some answers, I’d get found out, and she would withdraw the privilege. So I will be good. Sigh. The results will be better the more people send in their lists! So get moving on that! And I do really enjoy your comments. What would be on your list? Top 100 Picture Books – Again! I first started following Betsy Bird’s Fuse #8 blog back a few years ago, when she did the Top 100 Picture Books Poll. I didn’t start in time to contribute my votes, but I was captivated by her entertaining run down of the choices. She added web links, interesting facts, and other goodies on top of just the interesting facts of which books made the list. I did participate in her Chapter Books poll. That time, I made the mistake of things like voting for the third Harry Potter book, since it was my favorite, and voting for The World of Pooh, because it includes both Winnie-the-Pooh and The House at Pooh Corner. No one else thought of that, so my vote went nowhere. Now, with her much wider audience (I think), Betsy’s doing it again! But hurry — there are only a few days left! Trust me, if you don’t send in your votes, you will wish you had. She’s running both polls again. Once again, list your top 10 favorite Picture Books, and top 10 favorite Chapter Books. They will be given 10 points for first place, 9 points for second, and so on. Yes, this is very difficult to choose. She does suggest using the first book in a series. And I’m still having a problem with the definition of “chapter book.” Some of my favorites are rather in between. But I decided that when romance is one of my favorite things about the book, like The Blue Sword, by Robin McKinley, The Goose Girl, by Shannon Hale, and The Witch of Blackbird Pond, by Elizabeth George Speare, I’d leave those books out. I also decided to go with only one book by each author, so even though I like Emily of New Moon a little better (heresy, heresy) than Anne, I went with the more well-known, partly because I do think Anne is slightly more enduring, ground-breaking, and appealing to everyone. However, I’m going to indulge myself by listing my favorites here on my blog. I will also post these lists at my Sondy’s Selections page. Partly, I’m posting these to force myself to commit and choose my top ten! Okay, I’m going to go with nostalgia to decide which book to put on top. I actually remember, when I was a very little girl, hearing Captain Kangaroo read this book on television. I remember the way the camera panned over the ducks almost getting hit by the cars. I was fascinated with the book, and later we checked it out from the library. Later, I bought the book and read it many times to my sons. Best of all, when we visited the Boston Public Garden when my firstborn son was two years old, we visited the statues of Mrs. Mallard, followed by Jack, Kack, Lack, Mack, Nack, Ouack, Pack, and Quack. I took a picture of my son on Mrs. Mallard’s back, then taped that sweet picture into the front of our book. This was the first book my second son could read all by himself. And since then, I’ve used it in many library story times, and it always goes over well. Always. It’s got predictability, repetition, animal sounds, expressive drawings, and lovely surprising humor. Sylvester and the Magic Pebble is brilliant, but in this one, William Steig uses just the right amount of words and tells a wonderfully clever tale. This book has a perfect sample of Seuss stories. The title story has social commentary. The next story, “The Zax” is a pithy tale against stubbornness. Then for perfect Seussian word play, we’ve got “Too Many Daves.” Finally, I remember that incredible shiver of fear when I read about the pale green pants with nobody inside ’em. Funny how I didn’t find that story completely hilarious until I was an adult. I laughed and laughed when this book came in the mail from Children’s Book-of-the-Month Club. It’s a fairy tale parody perfectly carried out. I still get a big kick out of reading the temper tantrum page. The best alphabet book ever. Another one that is totally fun to read aloud. Though I remember much more clearly my husband reading it to my oldest son. Josh was in his lap, so he couldn’t see his face. As the Snort lifted the baby bird and the baby bird realized something was happening, I saw Josh’s face begin to crumple. When my husband cried out, “You are not my mother! You are a Snort!” my son burst into tears. Later, when I read that to him, I tried to keep all emotion out of my voice at that part, to try to reduce the trauma. I had to include this one. It’s such a classic, all you have to say is “even in Australia” to evoke all the emotion. Truly, some days are like that. Still. Okay, it’s getting late. So I’m going to put off my Top 10 Chapter Books until tomorrow. Happy Top Ten Tuesday! Today I’m going to list ten books I recommend for children just learning to read on their own. I had to stretch a little with this list, since I didn’t want to include two books by the same author, and the truth is that with my sons, I went heavy on books by the same authors. Lots of books by the authors mentioned here, not just one. So I’d love to hear from you in the comments. Which books have I forgotten? The titles I’ve reviewed will link to the review, and the others will link to Amazon. Next week, I doubt I will get a list posted, because my divorce case is scheduled to go to court Monday and Tuesday. But the week after that, I’ll post my top ten list of beginning chapter books. Be thinking of your favorites! Gerald the elephant and his friend Piggie are all ready to play outside when it begins to pour down rain. How can anyone be happy playing when it’s raining? There never were such good friends as the hippos George and Martha. The stories in this book are short and easy to read, but all pack a punch. Little Bear’s adventures with Mother, Father, his friends, and his grandparents all reflect a child’s life. This delightful new book tells about a pair of friends who are very different, but know how to compromise. Frances doesn’t want to eat a squishy soft-boiled egg. She wants only bread and jam. When Mother decides to indulge Frances’ whims, she begins to see the appeal of variety. This classic set of stories about two good friends shows Frog and Toad flying a kite, telling ghost stories, cleaning house, and even being alone. These simple stories will bring a smile. When the Cat in the Hat comes to play, nothing is ever boring, not even reading a book with a limited, easy-to-read vocabulary. The classic tale of a baby bird looking for his mother, but finding a Snort. This is the first of a series of easy-to-read mysteries featuring Nate, the pancake-loving boy detective. Last week I learned that I was not the first one to think of the Top Ten Tuesday meme, so after my list of Sondy’s Selections for ages 4-5, I’ll include a list for this week’s Top Ten Tuesday at The Broke and the Bookish — books that make me cry. The titles I’ve reviewed will link to the review, and the others will link to Amazon. Next week’s list will be books for beginning readers. Be thinking of your favorites! Timothy Smallbeast’s favorite pajamas wear out, but his mother mends them into Super Strong Pajamas. After a day helping others with his Super Strength, his new friends come to his aid when he needs them. Three sweet little wolves are up against a pig who “isn’t called big and bad for nothing.” When blowing down their houses doesn’t work, the pig starts in with a sledgehammer. This hilarious twist on the traditional tale will have everyone laughing. Bear does NOT allow visitors. But a persistent mouse quickly has readers wondering where he will pop up next. Despite Bear’s best efforts, the mouse shows Bear that some things are better with friends. In this Caldecott Medal-winning book, Sylvester the donkey finds a magic pebble and rashly wishes to be a rock when attacked by a lion. But how can a rock reach the pebble to wish himself back? Officer Buckle is sure that his safety demonstrations are a hit with kids. He doesn’t realize that his dog Gloria is acting out all the accidents behind his back. Everyone who sees this book will enjoy the silly situations as Millie the cow waits for the mail – so she can scare the mail carrier out of his wits. A cat learns that being too clever can backfire. Maybe not a great message, but very funny. The classic tale of a naughty rabbit outwitting Mr. MacGregor is still as pleasing as ever. A faithful elephant tends a nest because he meant what he said, and he said what he meant. This week their list topic is Books That Make You Cry. Now, when I was a teen, a book had to make me cry to be counted one of my favorites. But it was hard to remember which ones those were. I think I cried a lot more easily then! Now, please add to the fun and share your favorites (in either category) in the comments! 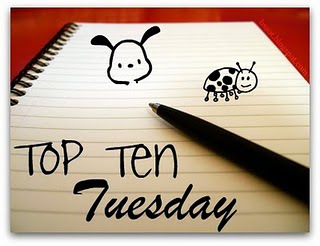 It’s Top Ten Tuesday! The day when I give a list of ten recommended books in a certain category. Today’s category is books for ages 3-4. It’s more fun if others join in! Please, join in the comments with your favorite books for this age group, or better yet a link to your blog post where you list your favorites. Even if you don’t have a list of ten, I’d love to hear from you! The more the merrier! The titles I’ve reviewed will link to the review, and the others will link to Amazon. Next week’s list will be for ages 4-5. Be thinking of your favorites! Rollicking sounds and rhymes have the naughty little letters of the alphabet climbing up and falling down from the coconut tree. Irresistible rhythm! Katie is a dog who loves the new little kittens but doesn’t know how to contain her enthusiasm for them. A great twist on welcoming new members of the family. This 2010 Caldecott Medal-winning picture book wordlessly tells the famous fable with lush pictures full of details your child will want to examine over and over again. This much-loved classic has ducklings Jack, Kack, Lack, Mack, Nack, Ouack, Pack, and Quack following their mother through Boston to get to the Public Garden, with help from kind policemen stopping traffic. The animals of the farm want something to do and go to the public library. But only the hen can get the librarian to understand what she wants. This Caldecott Medal-winning book plays with the rules of illustration to show the three pigs escaping the wolf by fleeing from their book, and then visiting other books to find resources to build a happy ending. This timeless classic tells of a very old woman and a very old man who want one little cat and find millions and billions and trillions of cats. Poorly named Fluffy is angry when others laugh at his name – until he meets a rhino whose name is even less appropriate. Farmer Fred is too serious. The animals on his farm try to make him laugh, and don’t succeed until something happens that’s very serious to them. This book will succeed right away at making the reader laugh, child or adult. A farmer goes to greater and greater lengths to keep bunnies out of his garden. Each time the bunnies get in, there’s a refrain ending with Muncha! Muncha! Muncha! It’s Top Ten Tuesday! Each week, I’m sharing my ten favorite recommendations in a given category. Last week, I listed books for babies, ages 0 to 2. This week, my list will be books for ages 2-3. I made the categories overlap so I could include more! Again, I’ll provide links to my reviews if I’ve written one, and links to Amazon if not. Top Ten Tuesday is more fun if others participate! Please leave a comment with your own favorite books for ages 2-3 or a link to your own blog post about it. Next week, I’ll cover ages 3-4. Reading this book, the child gets to make the rules. The pigeon begs and pleads and throws a temper tantrum, but please don’t let him drive the bus! When George tries to bark, the wrong animal sounds come out! George’s mother takes him to the vet, who finds animals inside George. Simple text gives excited anticipation as the animals get bigger and bigger. This classic book explores colors and shapes, in and out, over and under, using dogs and cars and a big dog party at the end. This book is a fun excuse to play along as Pete’s father turns him into a pizza – with lots of tickling as he goes. Fun sound effects abound throughout this story, as a red fox drives up a sky-high mountain and finds some friends. The pictures tell the story in this book where the gorilla follows the night watchman around the zoo, unlocking the cages. The little hippo’s silly Daddy keeps getting everything wrong, so he has to show Daddy how to do simple tasks. Five little ducks, named Widdle, Waddle, Piddle, Puddle, and Little Quack are trying to get the courage to jump into the water behind their mother. Splish! Splash! Sploosh! A simple story with strong rhymes portraying night time worries calmed after Mama Llama doesn’t come back as fast as little Llama wishes. PS: For even more fun, today, as if in honor of Top Ten Tuesday, the American Library Association announced the Teens’ Top Ten! Teens around the nation have voted on their favorite books written in 2009. Two of the books were also favorites of mine: Catching Fire, by Suzanne Collins was the Number 1 choice, and Fire, by Kristin Cashore, was Number 9. Congratulations to all the winners! So go pick up some great books for toddlers AND for teens! For a long time, the idea has been simmering that I should post my favorite books in different categories. I think it started when Betsy Bird of the Fuse #8 blog had her readers vote on their 10 favorite picture books, and later our 10 favorite books for middle readers. The idea was still simmering until a couple weeks ago, when I met with a team of child care specialists as part of my new job working for the Fairfax County Office for Children, Provider Services. I wanted to be able to contribute to the team some of my experience as a children’s librarian, so they suggested that I put together lists of books for different age ranges of children, so they could give these lists to new child care providers. So now I had several top ten lists, and I thought I’d better share them. I’ve got a new page on my main website, called Sondy’s Selections. I thought it would be even more fun if I could get other people to contribute their own top ten lists for the various categories. Since the choices are very personal, it would be nice to hear about other great books that you have enjoyed. I’ll provide a link to Amazon for the books I haven’t reviewed yet, so you can get more information. (And if you order the book through my link, I get a small percentage.) If I’ve reviewed the book, the title link will take you to my review (which also has an Amazon link). So, this week I’m starting with books for babies — ages 0 to 2. (Next week will be ages 2-3.) Please post in the comments your own top ten list! Or any good books for this age group that I’ve missed. Or better yet, a link to your own Top Ten Tuesday blog entry. The ultimate toddler book, this board book presents colors and items of clothing – and a turkey who always gets it wrong. Oops! This sweet-as-can-be picture book celebrates the love of all babies everywhere – especially your very own baby. A classic lift-the-flap book has Spot’s mother looking for him, but finding many other animals. Another lift-the-flap book has the zoo sending a child bigger and bigger pets until they finally send just the right one. Simple irresistible text shows different colored train cars traveling by. The classic bedtime book to soothe toddlers to sleep. The opposite of soothing, this book has a built in tickle game. This book uses rhymes to help a child guess which mama animal is coming next. A simple rhyming board book with holes to peek through and guess who’s hiding on the next page – ending up with a mirror to see Baby. Cat the Cat meets an assortment of new friends until she meets one that defies naming. I decided I want to start a Kidlitosphere meme. Even if I don’t get anyone else to do it, this will be a fun thing to do for myself. At my new job in the Office for Children, Provider Services, I was asked to use my Children’s Librarian experience and put together some suggested book lists for my team of Child Care Specialists — they work with Home Day Care Providers to give them tips and ideas about caring for children. Well, needless to say, I loved that assignment. I made several “Sondy’s Selections” lists of ten books that I would choose for several different age groups. I’m proud of the lists — they have a nice mix of old classic titles and brand new books. I decided I should definitely share the lists on my website. Then I got to thinking that it would be fun to find out what books other people will choose. So, next Tuesday, on October 12, 2010, I will post an entry of Sondy’s Selections for children from birth to two years old. This will be a list of the Top Ten books I would pick if I were starting a child care business with babies from zero to two years old. This will be a personal list, with my own preferences — that’s why I’d enjoy seeing lists from other people. See you on Top Ten Tuesday for Baby Books! You are currently browsing the archives for the Top Ten Tuesday category.